Melbourne is one of the stand-out destinations for campervan holidays in Australia, and it’s not hard to see why. Melbourne has it all – and, if you want to see it all, there’s no better way than to hire a motorhome and take the open road to explore this fantastic part of Australia. Melbourne itself has a great range of sights and activities for the campervan holidaymaker, including fantastic restaurants, harbour cruises, sailing, surfing, snorkelling and exploring the Yarra River. Melbourne’s camper parks are second to none, so you will be able to find some great places to park up and begin discovering the city. 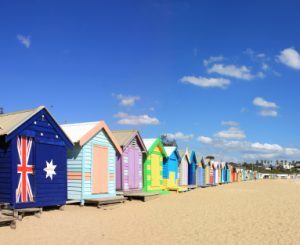 Situated on the south coast of Victoria, Melbourne also puts most of south east Australia’s attractions within easy reach. The joy of hiring a camper is that there’s no need to miss anything. One of the highlights is driving on the stunning Great Ocean Road to Kennett River, where you’ll see spectacular rock formations and rainforest and are sure to sight koalas in their natural habitat. It’s also easy to get to Phillip Island with its fairy penguins and the Koala Conservation Centre. Whether you are a seasoned traveller or setting out to see this part of Australia for the first time, there’s nothing quite like experiencing Melbourne and its surroundings on a vw campervan holiday. The natural beauty you came to see will be all around you – something no hotel can offer. You can enjoy the sun, sights and wildlife from the comfort of your camper van, and everywhere you go there is something new to discover. When you feel like moving on there’s a wealth of choice at your fingertips: one day you can be enjoying the cosmopolitan pleasures of Melbourne with its cultural highlights, and the next find yourself immersed in the lush rainforest or chilling out at one of Melbourne’s many tranquil beaches. Alternatively, leave your camper van behind for a day and take a scenic trip on the Yarra Valley steam train past the foothills of Victoria’s mountain region, with kangaroos, koalas and dingoes watching you as you steam by. Or take a boat out from Melbourne Harbour to spot whales, dolphins and seals. With camper van hire there’s none of the hassle and expense of having to pay for and find your way to hotels every night, no checking in and checking out. You’ll find places where you can park up your motorhome or RV with only the sea and sky for company, and relax in complete seclusion with a picnic or dinner cooked on the barbecue, with magical wildlife and inspiring scenery all around you. Melbourne is also renowned for its friendliness and the spirit of enjoying the great outdoors, so if you’re looking for company you’re sure to find fellow travellers to swap stories with over the camp fire. Hiring a vw campervan allows you to see the incredible sights of Melbourne in the way no other holiday can – and it will give you a holiday to talk about for many years to come.